with food, store, fuel and camping available. However, we understand that periodically you may want to get out and explore. This list features some of the most preferred and best Yelp, Trip Advisor and Google ranked places in the area. You can find a restaurant, store and hotel to help you and your guests enjoy your experience at the lake. You will also find information on camping, area attractions, hiking, biking, and fishing. 100 S Rio Salado Ln. Call 602-977-7170 for reservations and availability. Adjacent to the Roosevelt Lake Marina is the Roosevelt Lake Visitor Center. The center is staffed by knowledgeable people who will answer your questions about the area and Arizona. The rear patio presents a spectacular view of the lake. The center has several artifacts from the Salado culture. On exhibit are examples of storage pottery made and used by the people who inhabited this area more than 600 years ago. Tonto National Monument showcases two Salado-style cliff dwellings. Colorful pottery, woven cotton cloth and other artifacts tell a story of people living and using resources from the northern Sonoran Desert from 1250 to 1450 CE. Guided tours are offered to the Upper Cliff Dwellings from November through April, every Friday, Saturday, Sunday and Monday. Please call (928) 467- 2241 to check availability and to make reservations. For a comprehensive list of hiking and biking trails, as well as important safety information, visit the Forest Service web site. 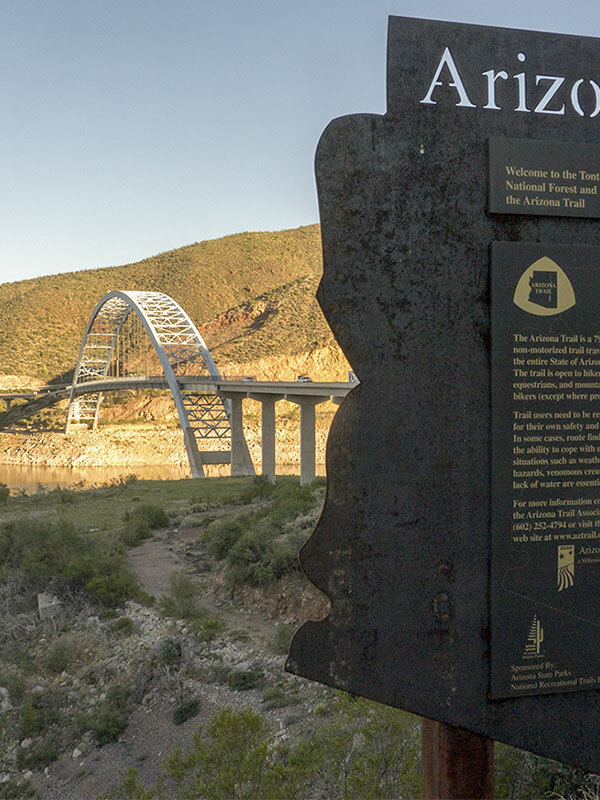 Information on activities around the Lake Roosevelt is found under the Tonto Basin Ranger District heading. Roosevelt Cemetery is the final resting place of some of the local settlers, as well as workers who built Theodore Roosevelt Dam. A self-guided walk is available. The Three Bar Wildlife Enclosure is a fenced wildlife study area operated by Arizona Game and Fish. The proximity of two recreation sites provides ample parking should you want to cool off in Roosevelt Lake after your ride. From the Frazier Trailhead, the trail meanders over low ridges and through drainages until it drops into Cottonwood Canyon. Trail passes through a variety of Lower Sonoran Desert vegetation plant communities. Spectacular views of Roosevelt Lake, Apache Lake, Roosevelt Dam and Four Peaks. Historic Camp O’Rourke located near the east terminus. From State Highway 188, the trail quickly climbs along an arroyo and then follows the contour of the ridges above the highway and Roosevelt Lake. Get the insider-scoop on all things fishing at Roosevelt Lake on the dedicated Fishing page. Clearly one of the most popular activities is to camp at Roosevelt Lake. That’s why we’ve got an entire Camping section of the site with all the details you need.